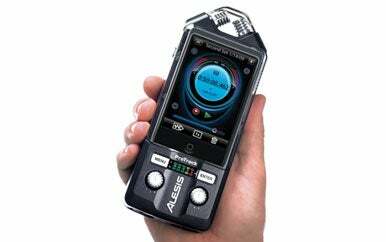 In the course of reviewing a pair of mobile audio recording apps—Audiofile Engineering’s FiRe Field Recorder and the free Blue FiRe—I had the opportunity to put Alesis’s ProTrack through its paces. The handheld stereo recorder works with the iPod to help you capture high-quality audio on the go. Unlike mobile microphones such as Blue’s Mikey ( ) which take a simplified approach to capturing audio, the Alesis ProTrack goes in a more complex, but still portable, direction. The device itself is relatively large—about seven and one-half inches long, just under three inches wide, and not quite two inches deep. The ProTrack provides a sled, with dock connector, into which your iPhone or iPod is placed. The device records to the iPod classic, fifth-generation iPods, second- and third-generation iPod nanos, and the second-generation iPod touch. It also worked with the iPhone in my testing. Two built-in condenser microphones are placed at the top of the ProTrack, while independent gain controls for each channel are located at the bottom of the unit, just below a VU meter. The ProTrack also provides built-in XLR style input jacks, along with 48-volt phantom power, essential for supporting the traditional connector style for audio cabling. The device is supplied with an AC power adapter, but also operates using four AAA batteries. The ProTrack provides a built-in screw mount, allowing it to be placed on a tripod or stand. You’ll probably want to do so, or at least set the unit on a stable surface, since handling the plastic case creates vibrations that can be transmitted to your recordings. A built-in headphone jack provides a playthrough feed that lets you listen to what you’re recording. There is a hardware limiter, and the device supports mono recording. With a list price of $399—though retailing for much less—the ProTrack is designed to meet the needs of professionals—and it delivers. In my experience with the system, features like playthrough and the adjustable gain controls for individual stereo tracks were indispensable in capturing quality sound. The one significant disappointment I encountered while using the system was the noise transmitted to recordings when handling it during recordings. The problem was easy enough to circumvent in static setups but could prove difficult in situations where movement of the recording device is necessary. Alesis says the ProTrack is compatible with a laundry list of iPods—the classic, the nano, and the touch. The company doesn’t say anything about iPhone compatibility, but I had no problem using an iPhone 3GS other than a message telling me that my phone wasn’t supported. Audio recorded just fine, however. Users looking for a plug-and-play option will want to turn elsewhere. But if your mobile audio needs are more demanding, the Alesis ProTrack is an attractive (although complex) option. ProTrack’s enhanced capabilities—particularly XLR inputs and individual channel gain controls—bring greater flexibility and control even in demanding recording environments.